Presence of nine "grahas" in our horoscope controls our karma, our longings and their related outcomes. Each one of these nine grahas exerts an influence (positive or negative) in our lives. The negative influences are known as the "dasa", which can be known from the horoscope of that individual. Our Pundits conduct Navagraha Puja in a customized manner for reducing all the negative effects and hence they improve the positive energies around the person. 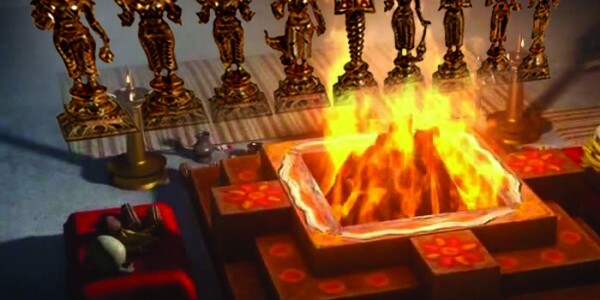 Navagraha Shanti Puja is one of the most powerful Vedic rituals that produce tremendous positive energy and hence help people to gain the potential and positive energy needed for effectively facing any such situations in their lives. Rituals performed for appeasing these Navagrahas diminish all the negative influences and hence infuse peace, prosperity and fulfillment. Blessings of these nine planets let the human being attain good health, prosperity, wealth, knowledge and education. The Navagraha Shanti Pooja is a spiritual accumulation of powerful rituals performed for pleasing respective planets and deities.